1 OWNER NO SMOKER LOADED FLORIA 2013 CHEVY TAHOE LT2, SUNROOF, REAR DVD, REMOTE START, BACKUP CAMERA AND SENSORS, MAGNA STEEL METALLIC WITH 4 TAN LEATHER CAPTAIN CHAIRS AND 3RD ROW SEATS, 5.3L VORTEC WITH ONLY 62,429 MILES. 2 KEYS, 2 REMOTES, 7 PASSENGER, TOWING PACKAGE WITH FACTORY BRAKE CONTROLLER, BOSE DOLBY DTS SURROUND CD, IPOD/AUX, XM, REAR A/C CONTROLS, LEATHER WRAPPED STEERING WHEEL WITH CONTROLS, BLUETOOTH, TILT, CRUISE, DIGITAL INFO CENTER, OUTSIDE TEMP, COMPASS, ADJUSTABLE PEDALS, DRIVER MEMORY, HOME LINK, POWER HEATED SEATS, SUNROOF, HATCH, WINDOWS, LOCKS, MIRRORS WITH LED TURN SIGNALS, KEYLESS ENTRY AND REMOTE START, LIKE NEW 275/55/20 TIRES ON FACTORY 5 SPOKE ALUMINUM WHEELS, NEW SPARE TIRE WITH JACK AND TOOLS, ROOF RACK, RUNNING BOARDS, REAR AND SIDE DEFROST, WEATHER FLOOR MATS FOR EACH ROW. REAL NICE 1 OWNER LOADED UP TAHOE! 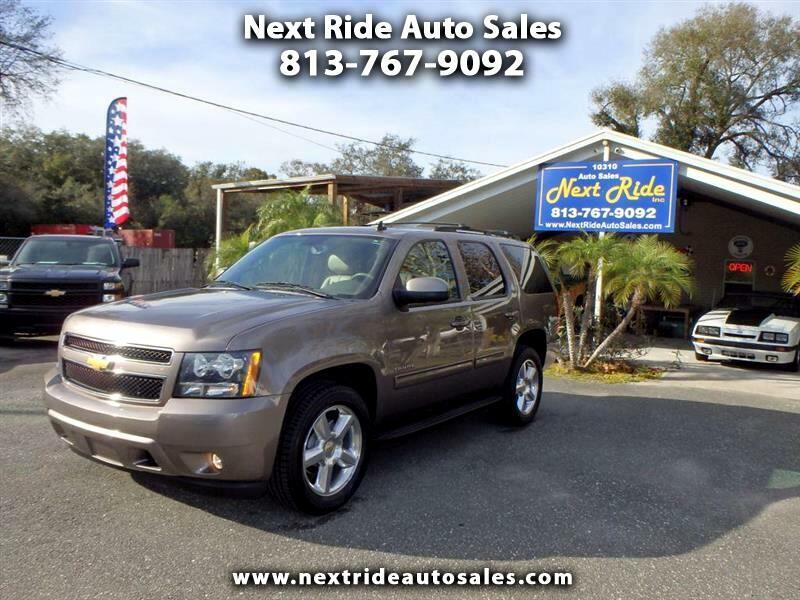 Visit Next Ride Auto Sales online at www.nextrideautosales.com to see more pictures of this vehicle or call us at 813-767-9092 today to schedule your test drive.